Senior Christian Francois celebrated senior night with a quick pin. Burlington wrestling team made senior night a special night by clinching a Middlesex League title for the first time since 2004. 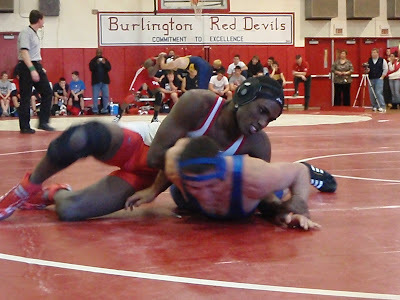 Burlington finished with a perfect 8-0 record in the league with a 64-15 win over the Lexington Minuteman. Three of Burlington's five seniors won their matches as John Carrabino and Christian Francois finished with pins in under one minute and Brendan Rigby won by Technical fall 20-2. Other seniors, Greg Romagna lost 7-1 to Lexington Star Joey DeCarlo, and John Murphy sat out last night. 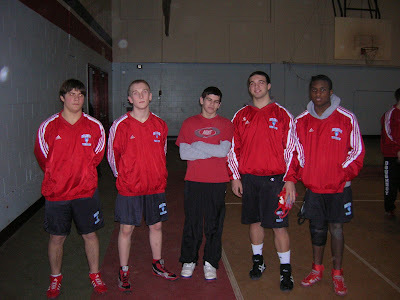 Pete Flemming, Steve Goetz, Matt Sherman, Mike Keating, Kevin Barrucci and Nick Cordeiro also pinned their opponents, Alex Giampapa finished with a 16-0 Tech fall and Jason Hubbard received a forfeit. Burlington finished off a dominate run through the Middlesex League as they beat every opponent by over 20 points and won 81 individual matches against only 31 loses (11 by forfeit). Congratulations to Coach Shvartsman and his entire staff for this accomplishment! Burlington is now 24-1 and 8-0 in the Middlesex League.